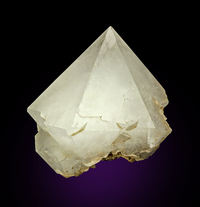 A neat large pyramidal translucent lustrous colorless quartz crystal measuring 8.0 x 8.0 x 6.6 cm in size set on a thin matrix. Complete all around - no damage. This shows no prism faces and is somewhat unique. Ex Wolfgang E. Henkel collection. 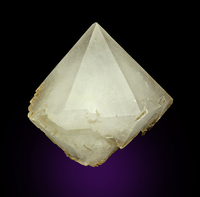 Ref: The Mineralogical Record: 32: 3-30.